Are you ready for this? We can say that the Galaxy Tab S2 is the flagship, top of the class Android tablet offering from Samsung. The Asus ZenPad 10 is not the premium ZenPad S Series, but we think it’s fair to put both these similar sized tablets into a full-on vs. battle. Keep one thing in mind. The ZenPad 10 is built more for affordability and would not be considered an Asus flagship product. Putting the ZenPad 10 up against the Galaxy Tab S2 is not exactly a fair fight as it were. Price wise, these two tablets are going to be priced vastly different so keep that in mind in this comparison. As we move along here, we will update with official details of the Galaxy Tab S2 9.7 because it’s not quite official just yet at the time of writing. In terms of actual build quality, the Tab S2 is going to own the ZenPad 10. Samsung has obviously put a lot of effort into creating the lightest and thinnest tablet on the market. We will create this as a ratio for weight because the Galaxy Tab S2 is 9.7-inch whereas the ZenPad 10 is 10.1-inch. So for thinness, the ZenPad 10 is 7.9 mm but the Tab S2 is 5.6 mm. Not a typo, this is apparently correct information. Weight wise, the ZenPad 10 is 50g per inch but the Tab S2 9.7 is just 42g per inch. In terms of cosmetics and build specs, that Tab S2 is a clear winner. Processors comparison, the Galaxy Tab S2 is using a 1.9GHz octa-core Exynos 7420 and the ZenPad 10 is using the Intel® Atom™ x3-C3230 Quad-Core, 64bit @ 1.2GHz [source]. RAM wise, the Tab S2 9.7 has 3GB and the ZenPad 10 come in a 1GB or 2GB configuration. 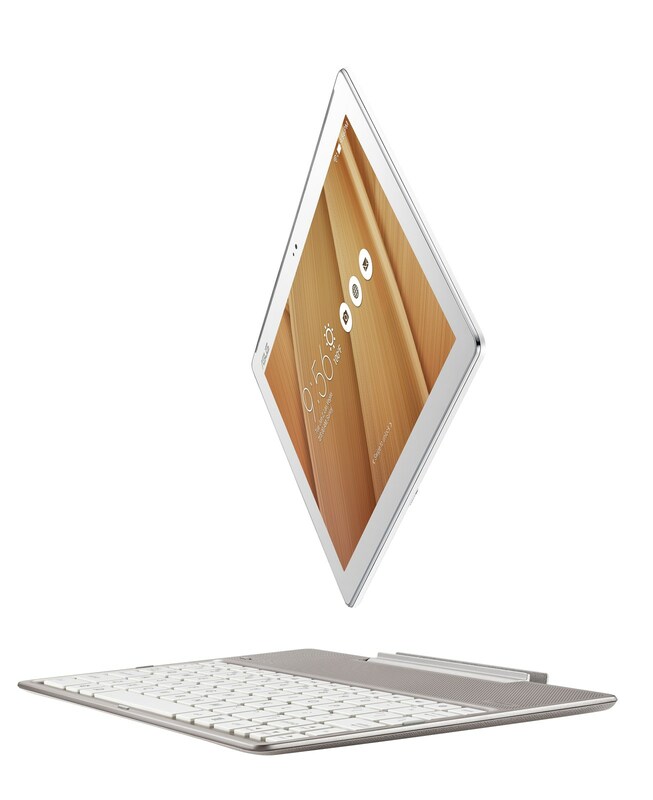 Resolution wise, the Tab S2 is top of the class with a 2048 x 1536 display and the ZenPad 10 has a 1280 x 800 display. Aspect ratio is different, with the ZenPad 10 having a 16:10 ratio whereas the Galaxy Tab S2 uses a 4:3 ratio. Ratio wise there is no winner as they both have their pros and cons. Both of these tablets have microSD slot expansion, so no advantage either way in terms of expanding storage capacity. Wireless connectivity, we do know that the ZenPad 10 has wifi a/b/g/n but no ac. The Galaxy S2 9.7 does comes with the newest wifi ac standard. Audio wise, we would give the edge to the ZenPad 10 because of the dual front facing speakers. The Galaxy S2 has speakers on the one side edge only. It’s hard to imagine a side facing speaker being better than front facing, but until we hear otherwise, ZenPad 10 has the better speakers. Battery life is simply not measurable at this time of writing. We can speculate only, so let’s do that. When you consider the thinness and light weight of the Samsung Tab S2 9.7, and top that with a super high resolution screen, we wonder if the battery will be able to hold up. On the flip side, the one benefit to having the lower resolution screen on the ZenPad 10 is likely going to be in terms of battery life. It would be surprising if the ZenPad 10 gets less battery life, that’s for sure. From a sheer battery size comparison, the ZenPad 10 has a 4,890mAh battery and the Tab S2 9.7 has a 5,870mAh. On that basis, it’s most likely Samsung will get a longer battery life, but let’s wait for a final verdict. Camera wise, the Galaxy Tab S2 9.7 beats out the ZenPad 10 rather handily. The rear on the Tab S2 is 8MP, and the best option on the ZenPad 10 is 5MP. Front camera, the Tab S2 9.7 comes with a 2.1MP and the ZenPad 10 has a maximum 2MP depending on the configuration. Because we know the ZenPad the best, we will start off with the two fairly substantial unique features. First, the ZenPad 10, all models, support the Z Stylus pen input. Secondly, the ZenPad 10 has a keyboard dock/audio dock accessory. In terms of what the Samsung Galaxy Tab S2 9.7 offers that the ZenPad 10 doesn’t have? We believe there will be a fingerprint reader on the Galaxy Tab S2. With official Galaxy Tab S2 9.7 specs out there now, we can see that the finger scanner is something unique over the ZenPad 10. Beyond that, there isn’t an outstanding feature that the ZenPad 10 is without. We need the prices really. I mean if one tablet is almost twice the price then this isn’t fair fight. The thing is that Z300C should be Compared to Both Samsung tab4 10 and new Samsung Tab A 9,7″…unfair comparison.